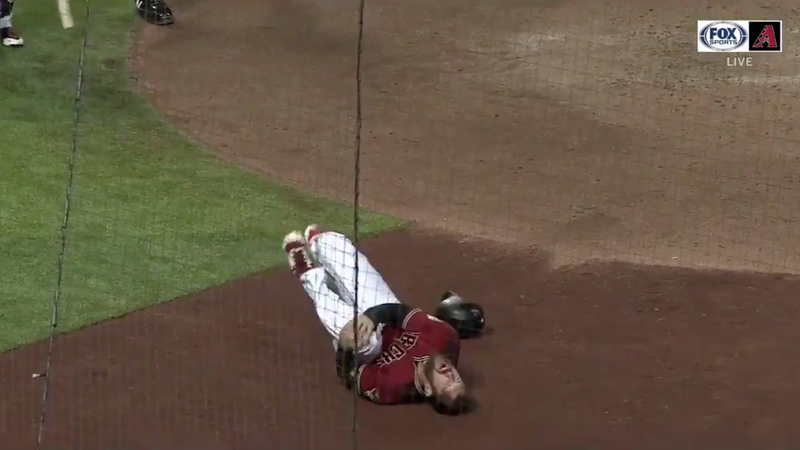 Arizona Diamondbacks outfielder Steven Souza Jr. suffered some catastrophic tears in his left knee Monday night in one of his team’s final exhibition games before the start of the season, after he slipped on home plate while scoring a run. He’ll be forced to miss the 2019 season. Video of the freakish accident can be seen 30 seconds into the following video, and 35 seconds into the next video. As he touches the plate, his left leg twists at the knee in a way it’s not supposed to twist, and Souza falls to the ground in serious agony. Video from field level, where you can hear Souza’s pain, makes it viscerally clear how bad this injury is. Souza missed a chunk of last season for an injury originally suffered in spring training as well—though that was only a strained pectoral muscle. In his last full season—2017 with the Rays—he slugged 30 homers, and he was expected to start in right field for the D-Backs this season. Adam Jones or Jarrod Dyson will likely take his place.